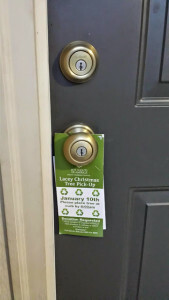 Saturday, December 19th we will be handing out the door hangers in Lacey to remind people about the Boy Scout Tree pickup and to leave/mail us a donation. Meet at 8:30 a.m. at the Meconis Parking Lot. Saturday, January 9th, 8:30 am we will be picking up Christmas Trees in North East Lacey — People have been asked for a donation. Meet at the Meconi Parking Lot at Hawks Praries. This is North of I-5 and on the West side of Marvin Rd. We need pickup truck and/or trailers to carry trees. We’ll be picking up trees along the street and taking them to the recycling center. 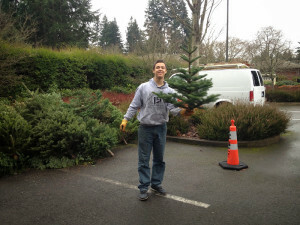 For the sixth year in a row, the City of Lacey has paired with Scout troops to arrange for curbside tree pick-up. While they provide this as a community service, they will also gladly accept donations towards future troop endeavors.